Yesterday I passingly mentioned on a post that stats show the Fedora user base is shrinking (looking back, I probably should have said "seems to be shrinking"), which made for a later conversation with someone genuinely asking for the numbers, someone else challenging my conclusion and someone else not taking a solid stance either way. First, I want to make it even clearer, I was not talking about contributors or project health, which can be measured with completely different metrics, but just about the users base, which was relevant in the context of my post (users will have to inflict UEFI with Secure Boot). Second, there is no absolute way to count the user base for a Linux distro, you can't do it the Windows way by counting sold licenses or pre-installed computers (well, neither that is accurate, not counting the unlicensed installs), nor you can use web usage statistics (not every computer is online, Linux desktop market share is too small and easily affected by rounding errors), so the best way our community was able to come with was counting package updated via yum (the wiki statistics page has explanations about the methodology and its flaws). 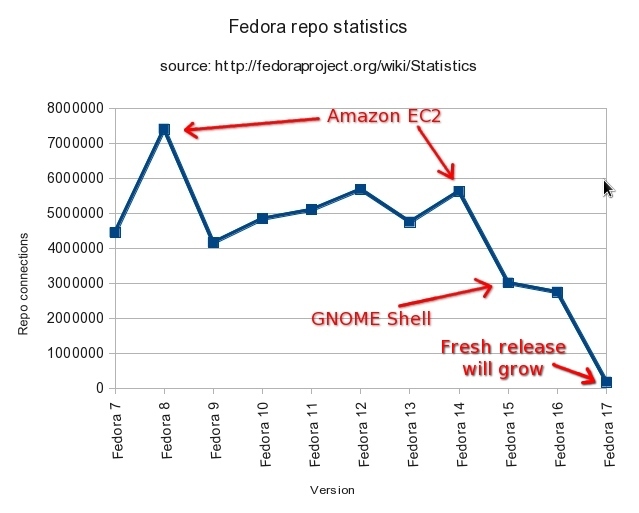 There was an absolute peak with Fedora 8, which is possibly attributed by the statistics page to a massive Amazon EC2 presence with images provided by various entities/companies. Community-wise, the distro was then at a Maximum, with everything opening left and right, people being enthusiastic. Is the time you will see past and present contributors remembering as "good old times". Another, much smaller, peak happened with Fedora 14, which can also be attributed to the Amazon EC2 presence. The chart shows a big dive with Fedora 15, the numbers where still have time to increase but not much, it will be EOL-ed in a few weeks. Fedora 16 is mid-life, until December when it will reach End Of Life, more installs will happen, is too early to tell if it will surpass F15 or not, we'll talk about that in half a year. Of course Fedora 17 is near the bottom, is a fresh release with statistics for after only one week, so far it shows, according with the statistics page, more yum connections and less direct downloads compared with the previous release. Well those numbers are right, but what about OLPC each XO pc deploy uses Fedora, each of those Fedora has it own update mechanism that is not based on yum and goes to their own repo. If we count only Uruguay has almost 500K OLP deploy, so the question is can we count OLPC users as part of our user base? I don't know, I guess OLPC is a different derivative distro (the software is very different) and its user base it totally different and not to be counted to Fedora's user base of voluntary Linux consumers who are computer knowledgeable and likely collaborators. The software is 98% fedora with a few minor package deviations. The UX is sugar which is shipped as one of the many desktops shipped with Fedora. The user base is no different from your average Linux desktop user (as opposed to contributor). There's over 2.5 million deployed XOs and that figure will reach 4 million by the end of the year. They go through their own update platforms for a number of reasons, one is to control the updates once they've gone through their own QA but also a lot of the schools don't have large amounts of bandwidth so they hold local mirrors of the QAed updates. Im sorry. I using Fedora much less now according to your method. I went from being a >100 IP-user(dynamic IP ISP service) to being a <10 IP user (static IP ISP service). And yeah Im roaming on fre wifi to a much lesser extent now as well since I dont need the service anymore. Please do continue your quest against gnome-shell, I seems to be your passion. And yes, please ignore the 133% first week succes of F17 as well. It might be the end of the natural backlash from introducing gnome-shell. Your continued quest can serve as a museum for old rants. See you next week for another round of gnome-shell rantng. i said about F17 first week "according with the statistics page, more yum connections and less direct downloads compared with the previous release"
I suspect another reason for Fedora 8 being a maximum was that people stayed on it longer than usual to avoid Fedora 9, because of the major changes in it (KDE 4.0 and some more). The same is probably true for the local maximum at Fedora 14 (avoiding Fedora 15 because of gnome-shell). There has to be a combination of causes, since the F8 difference is huge. People avoided F9, but F10 returned tu values comparable with F7, which is not yet the case with F16. Let's wait and see the F17 numbers, they may surpass F16 or F15, the question is how they will fare compared with F9-F14 releases. Probably the numbers will go again crazy, up or down, due to Secure Boot in 18. I've been a regular Fedora user for many years. I run my own local group of around 16 virtual machines for testing and developing Java based web services. I used to use Fedora as my default install because it gave me access to the latest versions of the software development tools and programming languages. I stayed with Fedora 8 for as long as I could to avoid having to deal with NetworkManager as the default network management service. NetworkManager is/was great on a laptop for handling dynamic connections to wifi networks, but for a desktop or server with a single hard wired network connection it just got in the way. As a result I have gradually replaced Fedora with a combination of CentOS and EPEL on all of my test and development servers.